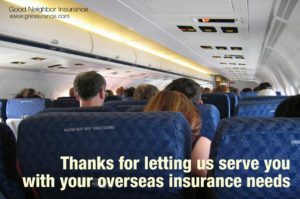 Trawick Safe Travel international medical insurance is one of our more popular travel plans here at Good Neighbor Insurance. 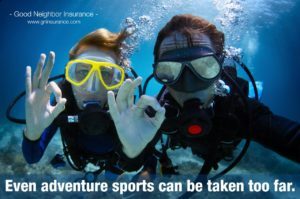 For those seeking coverage for their overseas travel activities please check out Good Neighbor Insurance at our website www.gninsurance.com for your medical and travel needs. Or you can contact one of our insurance specialists at 866-636-9100 and ask about specific coverage options for all of your needs. Non U.S. citizens traveling to Countries other than the U.S.
May be extended up to a total of 24 months if initial purchase is for 3 months. Coverage ends on expiration date or on return home (no continuation of benefits). Safe Travels International plan provides Accident and Sickness Medical, Accidental Death and Dismemberment, Emergency Medical Evacuation, Emergency Reunion, Political Evacuation, Trip Interruption, Repatriation, and Travel Assistance to individuals while traveling outside their Home Country, but not visiting the United States. It can provide coverage for you, your spouse/domestic partner/traveling companion and dependent children/grandchildren up to age 21 years. Coverage for International travel with Trip Cancellation is available through Safe Travels USA or Safe TravelCare 360. Customized coverage for groups of 5 or more people is available under the Safe Travels for Groups. If a covered Injury or Illness occurs during the Policy Period and you require medical or surgical treatment; this plan will pay, subject to the selected deductible, applicable co-insurance and benefit maximums, the following Covered Expenses, up to the selected policy maximum. The first charges must be incurred within 90 days after the date of the Covered Accident or Sickness. No benefits will be paid for any expenses incurred which are in excess of Usual and Customary Charges. Hospital Room and Board Expenses: the average daily rate for a semi private room when a Covered Person is Hospital Confined and general nursing care is provided and charged for by the Hospital. In computing the number of days payable under this benefit, the date of admission will be counted but not the date of discharge. Daily Intensive Care Unit Expenses: three times the average semi private room rate when a Covered Person is Hospital Confined in a bed in the Intensive Care Unit and nursing services other than private duty nursing services. Medical Emergency Care (room and supplies) Expenses: incurred within 72 hours of an Accident or Sickness and including the attending Doctor’s charges, X-rays, laboratory procedures, use of the emergency room and supplies. Doctor Non-Surgical Treatment and Examination Expenses including the Doctor’s initial visit, each Medically Necessary follow-up visit and consultation visits when referred by the attending Doctor. Physiotherapy Physical Medicine/Chiropractic Expenses on an inpatient or outpatient basis including treatment and office visits connected with such treatment when prescribed by a Doctor, including diathermy, ultrasonic, whirlpool, heat treatments, adjustments, manipulation, or any form of physical therapy and limited to $50 per visit, one visit per day and 10 visits per policy period. Dental Expenses up to $250 due to Accidents or emergency alleviation of pain including dental x-rays for the repair or treatment of each tooth that is whole, sound and a natural tooth at the time of the Accident or emergency alleviation of dental pain. Prescription Drug Expenses including dressings, drugs and medicines prescribed by a Doctor. Emergency medical treatment of pregnancy up to $2,500 per policy period. Mental or nervous disorders or rest cures up to $2,500 per policy period. Keep you and your loved ones safe and secure while traveling overseas with travel and medical insurance. Call one of our Good Neighbor Insurance Specialists at 1-866-636-9100 for all your travel and medical insurance options. Check us out at our web site www.gninsurance.com to find the best and most cost effective insurance for your travel and medical needs. Don’t forget a picture is worth a thousand words, especially of the one you love!